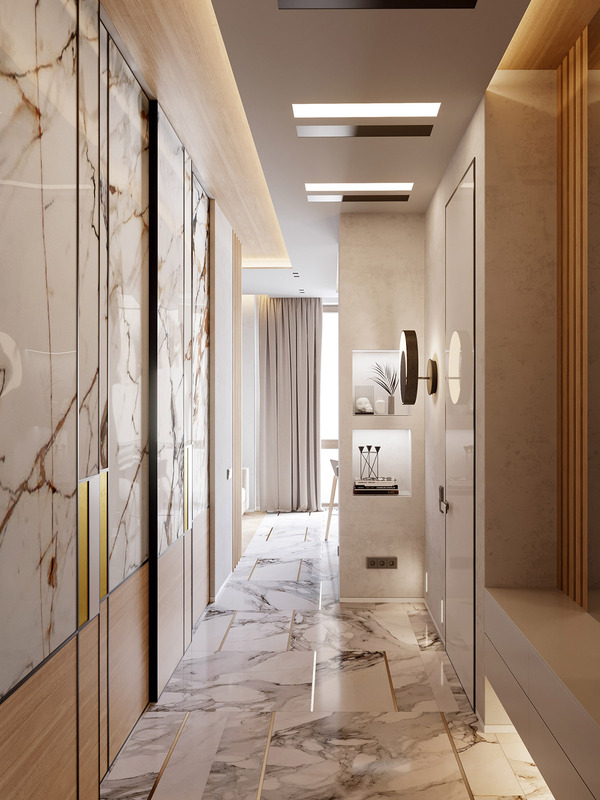 There is something very luxurious about the grand combination of misty veined marble and rich wood grain. 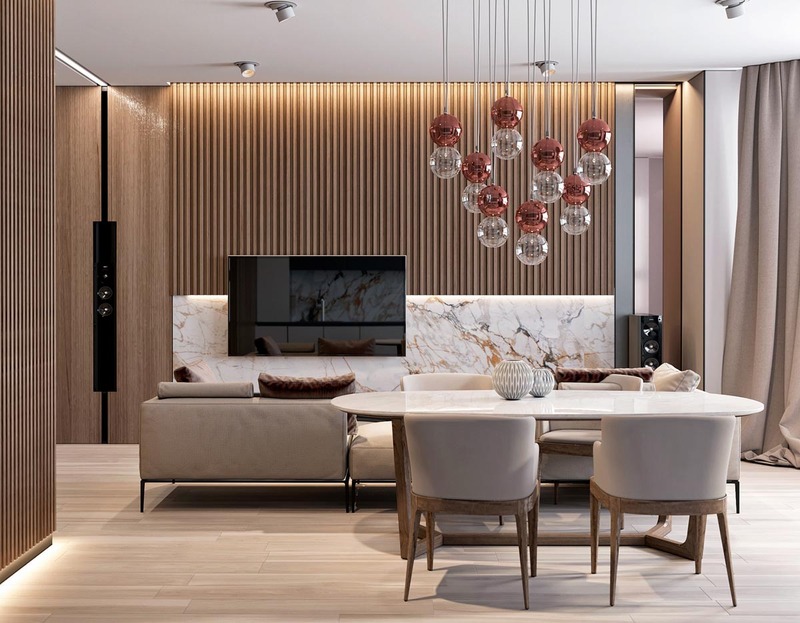 The teaming of natural materials brings life to a modern apartment interior and can be incorporated in a myriad of ways. 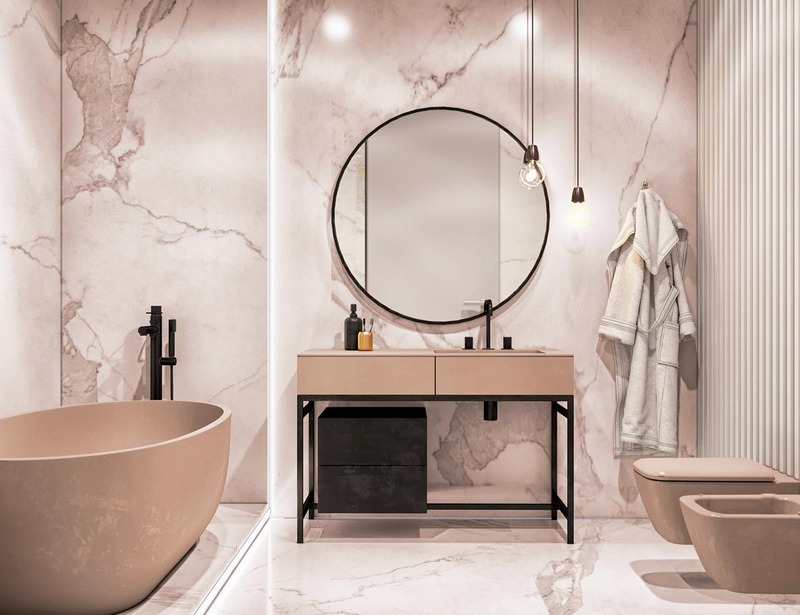 Floors, bathroom tiles and kitchen backsplashes have long been clad in marvellous marble finishes, but how can we apply other areas of organic patterning to add interest and movement to hard contemporary surroundings? Wood tone is ideal for furniture, floors and panelling but how can we freshen our use of the material? 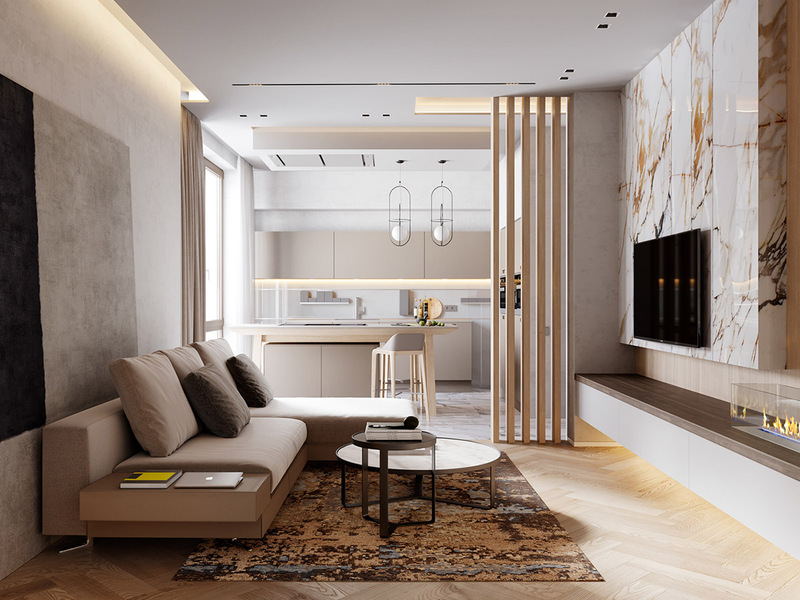 These two apartments show how to create soft neutral backdrops of marble and wood that won’t leave a sophisticated decor scheme falling flat. Beyond shining globe pendant lights, a slatted wood wall adds dimension over an entertainment wall in our first featured home. A flat screen television is mounted partially over the wooden slats, with its lower half hanging over a white, grey and golden tone marble panel. A strip of white LED lighting runs through the cross section. 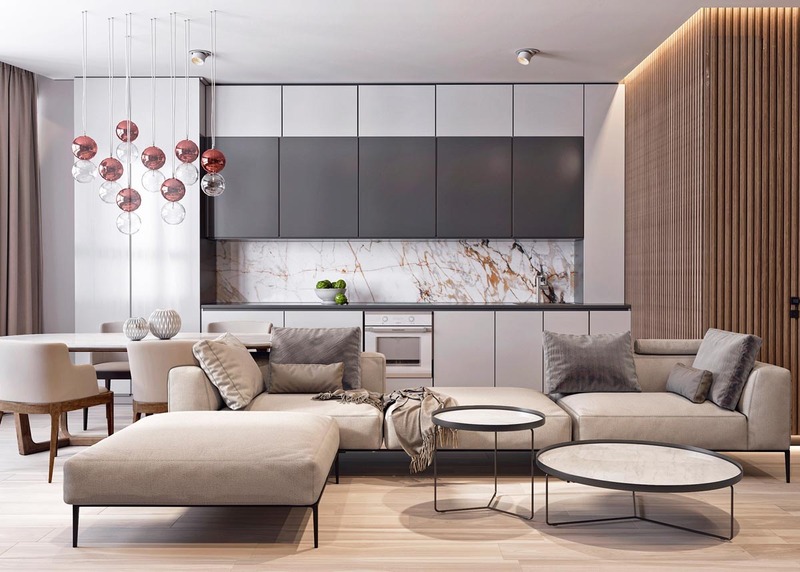 Two round glossy white coffee tables with black frames complement the white marble backsplash and black kitchen wall cabinets behind the lounge. Wood slat walls catch the light in a more interesting way than a flat wall panel could, creating areas of light and shade. Placing flat wood panels adjacent to a slatted feature provides an attractive change in texture. 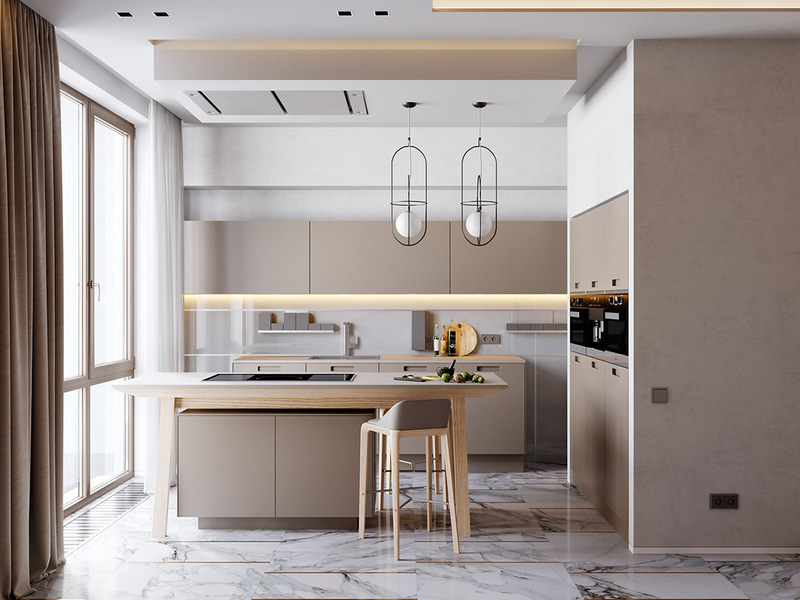 The dining pendant lights provide a little colour within the white marble and wood decor scheme, though are still in-keeping with an earthy palette. 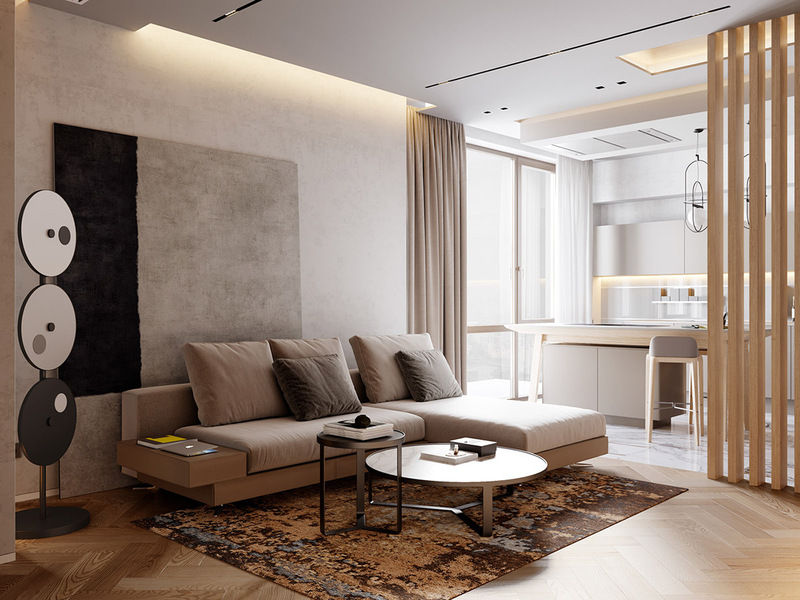 A slender white floor lamp stands by the bedside on a light wood bedroom floor. A matching bedside table lamp sits on the opposite side, on top of a dark wood bedside unit. 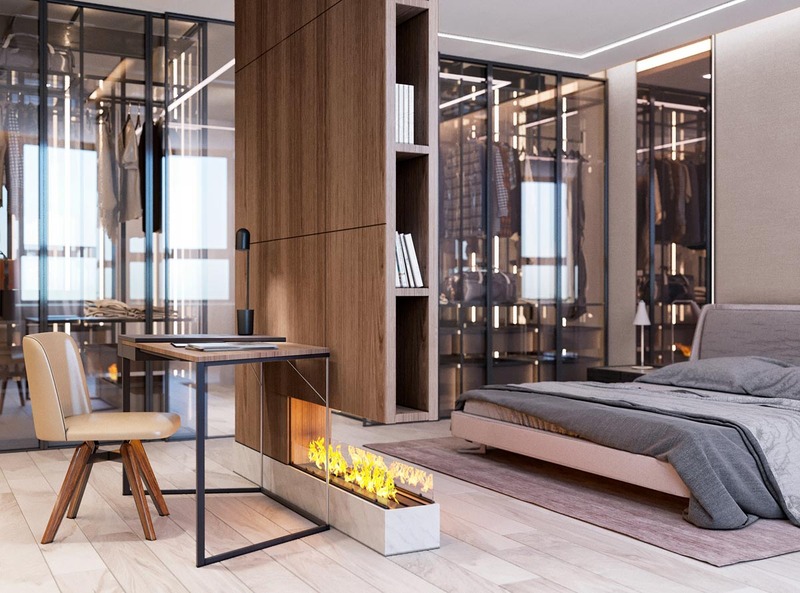 Behind the wooden drawer unit, a tall smoked glass bedroom mirror echoes the height of an adjacent glass closet. 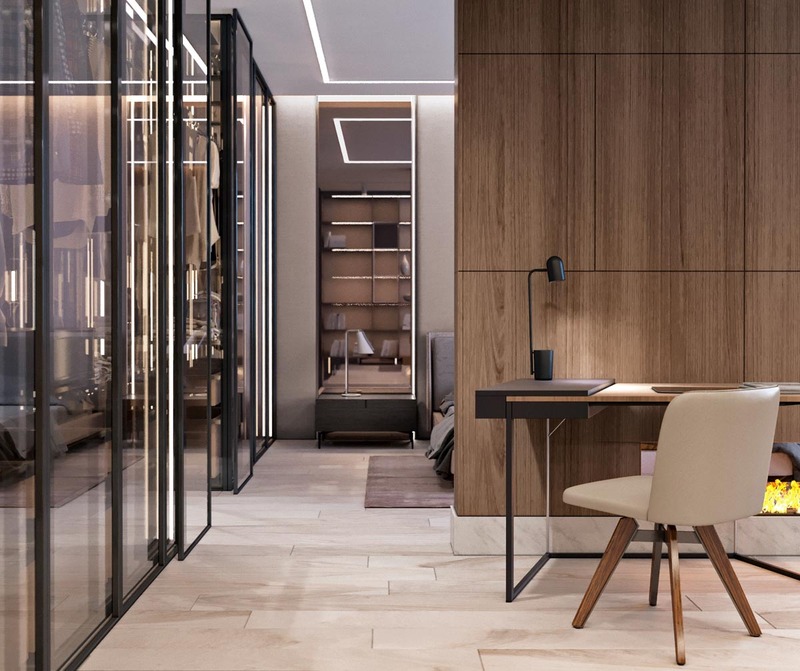 The glass closet is a walk-in design, where the wood flooring from the bedroom continues seamlessly. 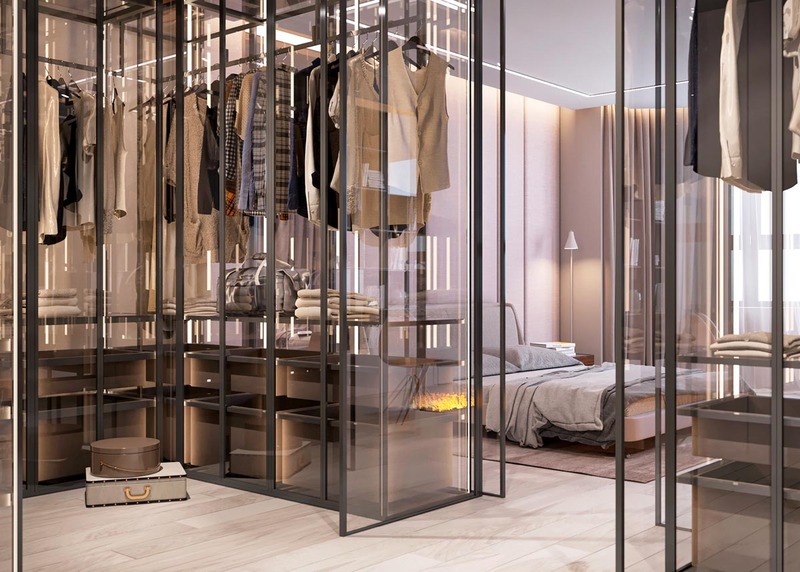 The contents of the wardrobe are on view to the bedroom, making the space look like a trendy clothing boutique. 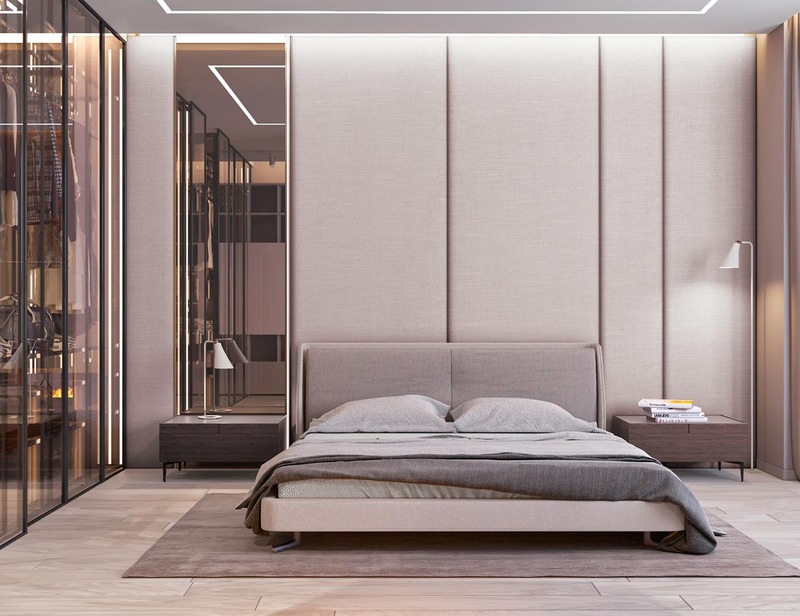 At the foot of the bed a bespoke wooden volume has been crafted to hold a contemporary feature fireplace, and to divide the room into two separate zones. 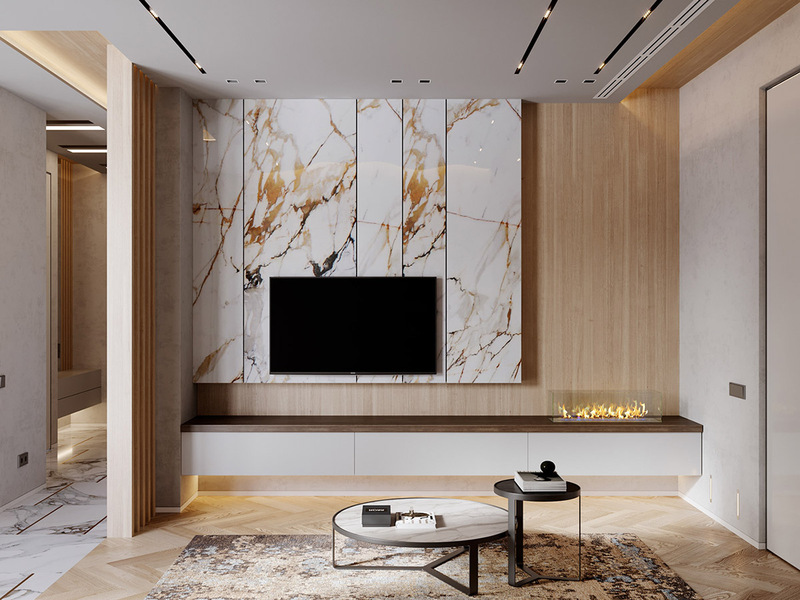 The hearth of the fireplace spans the volume in a stripe of white marble. 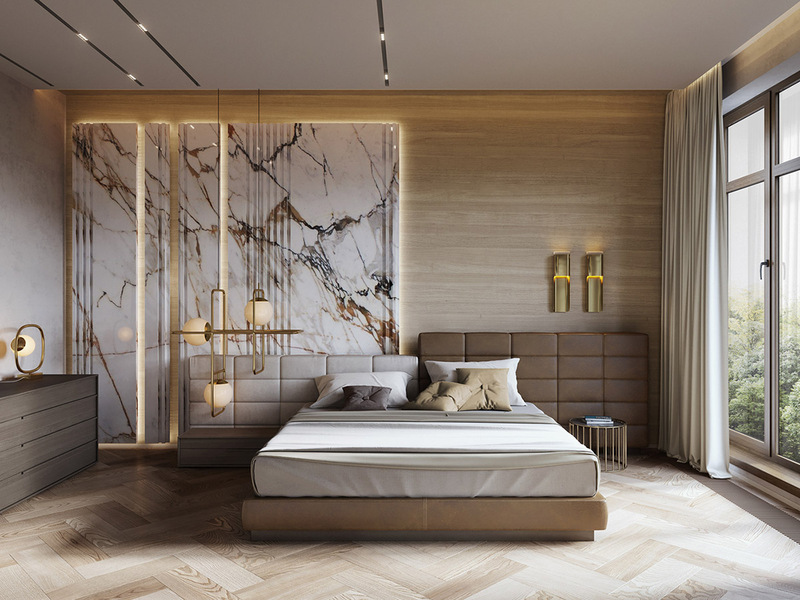 The combination of wood and marble makes the new installation appear established and permanent. Behind the dividing wall stands a home office area. The side of the dividing wall has been fitted with bookshelves, which are easily accessible from both the desk side and the bedroom. 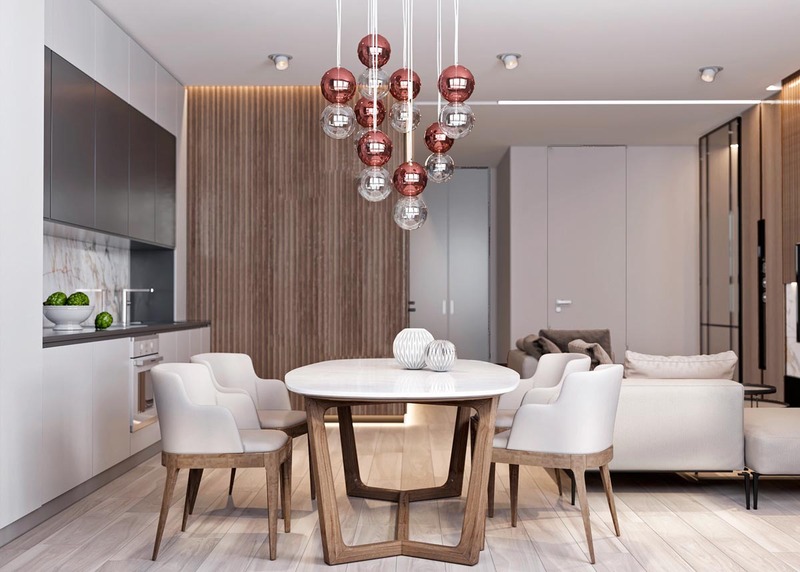 The sleek wood and metal desk is equipped with a small designer table lamp. 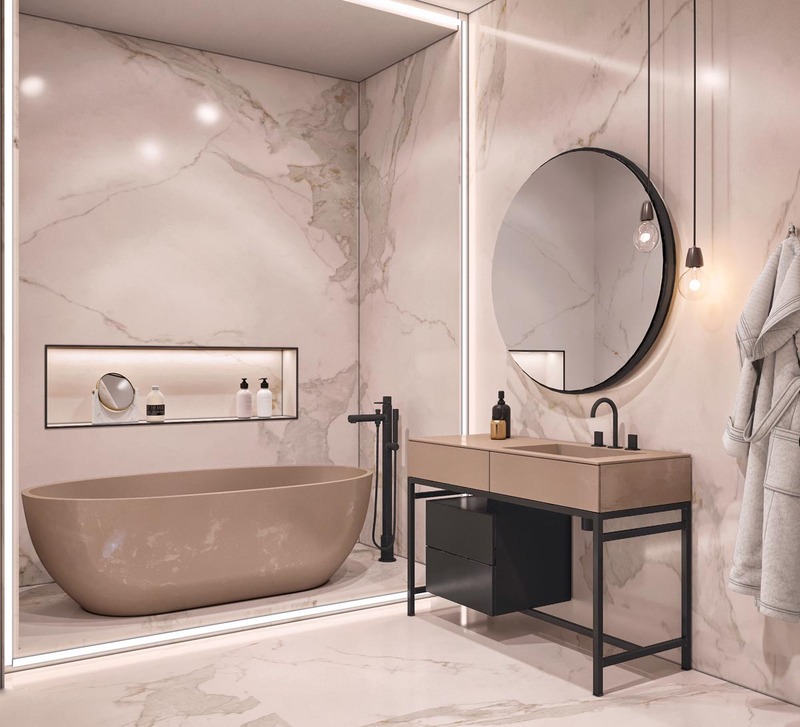 In the bathroom, a modern bathroom vanity, freestanding bathtub, toilet and bidet are of a beige colourway that brings out the colours in the surrounding marble that clads the walls and floor. 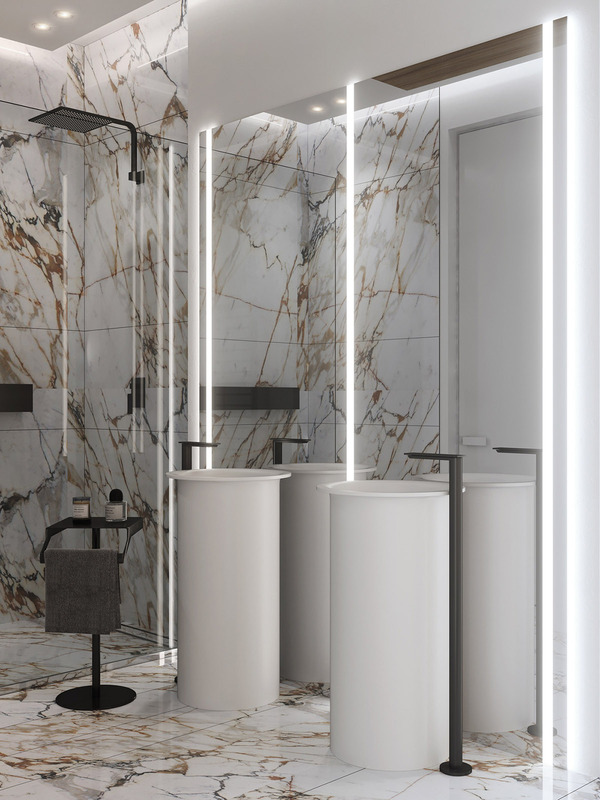 Black metal framing and black faucets give the marble cladding a contemporary edge. 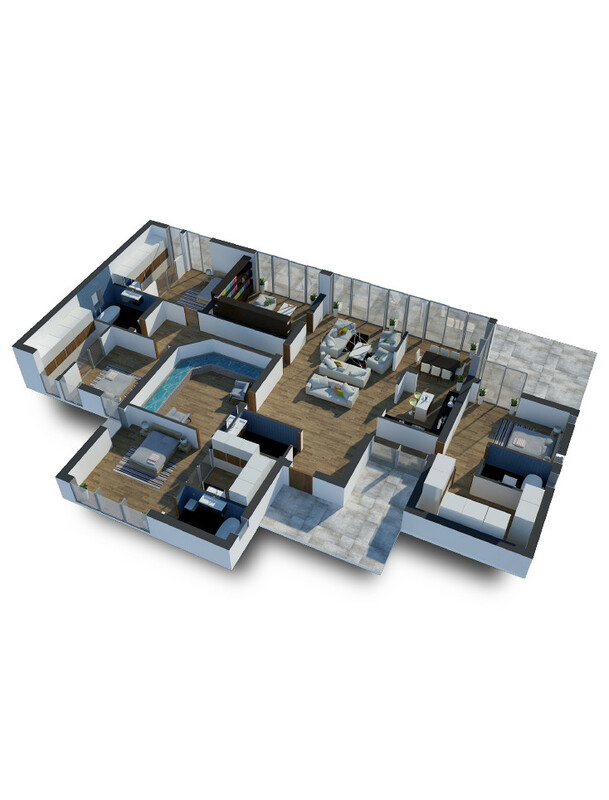 Our second apartment is a summer home located in a luxury resort area, situated by the Finnish bay just outside of Saint-Petersburg. 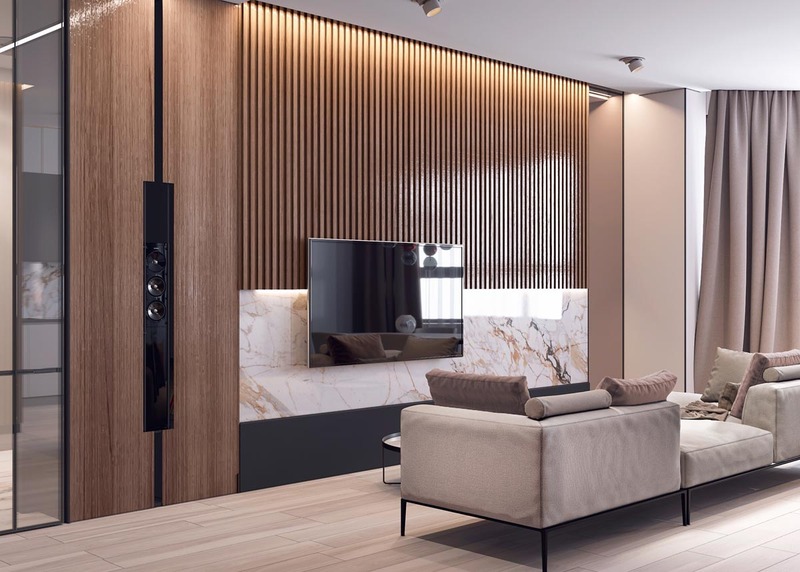 The TV wall decor is a combination of marble and wood panelling. 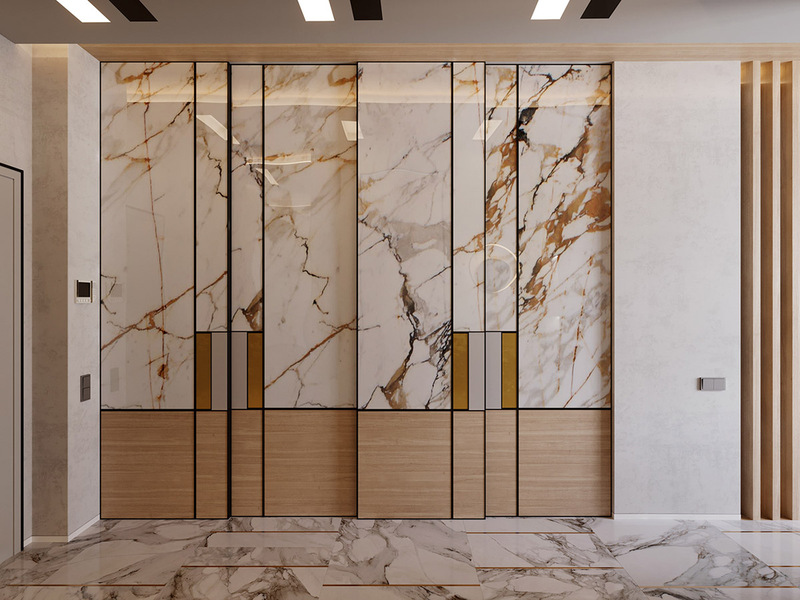 The golden patterning in the marble works in perfect harmony with the blonde tone of the wood. A plain white console unit is wall mounted beneath the television, with a darker wooden shelf top. 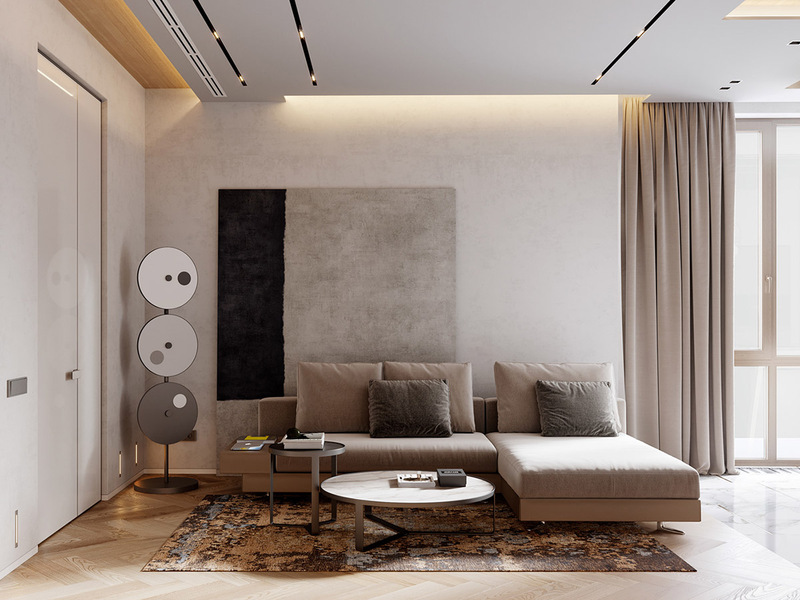 A beige modern sofa sits on top of a textured area rug that complements the texture and colours of the marble feature wall. 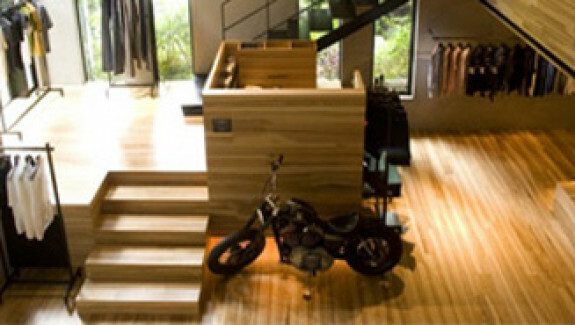 A wooden herringbone floor in the lounge runs into a marble floor towards the kitchen diner and hallway. 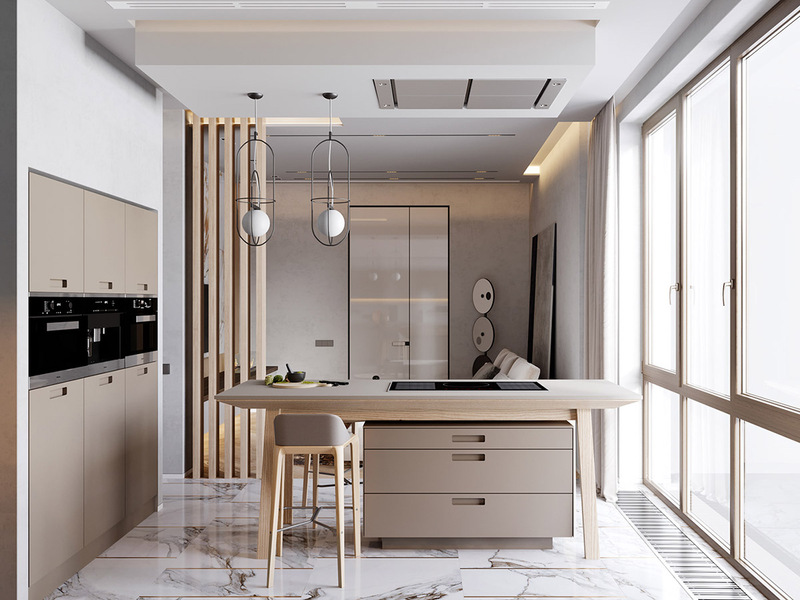 Sophisticated marble floor tiles are showcased in this soft beige minimalistic kitchen. A slatted wooden wall makes a partial divide between the lounge and the living room, and provides an effective visual stop. The wooden legs of the kitchen bar stools tie in with the look of the slender light slats. 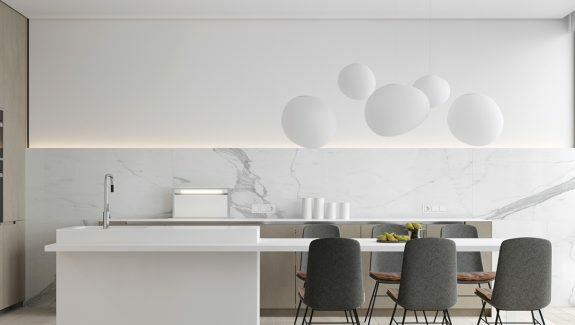 White glass orbs in the unique kitchen pendant lights match the sheen of white marble. 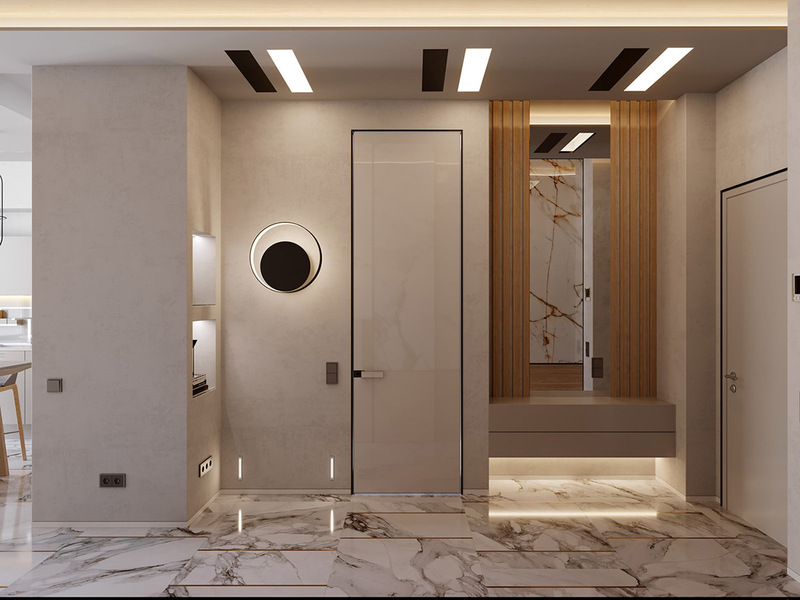 In the hallway, sliding closet doors are constructed to match the marble and wood decor. 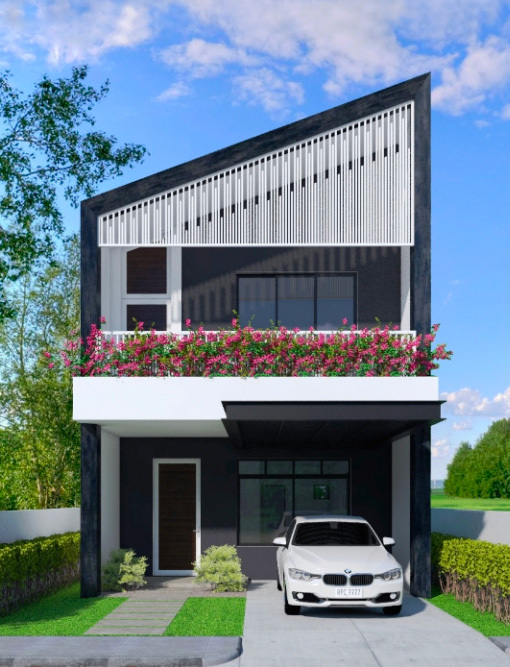 Home storage systems and decorative marble constructions in this home were custom made according to the architects’ drawings. Decorative vases nestle within the recessed shelving of a white concrete wall. Two gold modern wall sconces light one half of the headboard wall. Four backlit marble panels illuminate the other side. 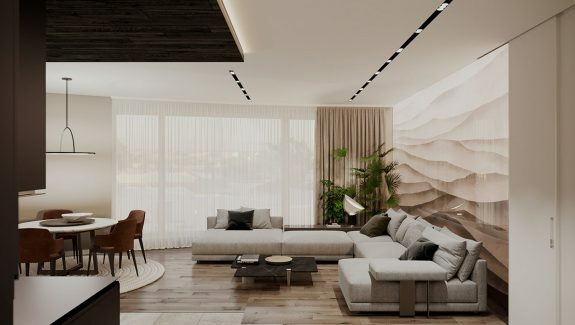 Ridges run down the marble wall panels to create an interesting modern look. 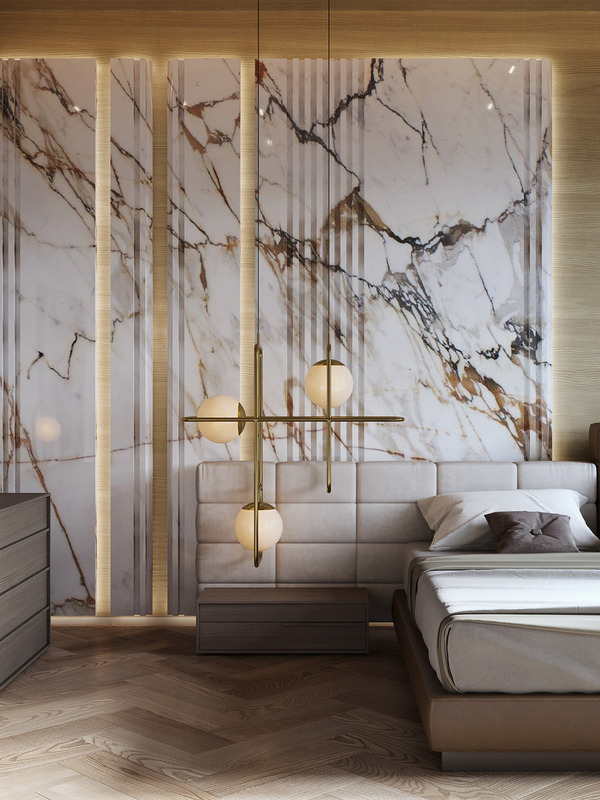 The glossy surface of the marble feature wall reflects the glow of a gold bedroom pendant light. 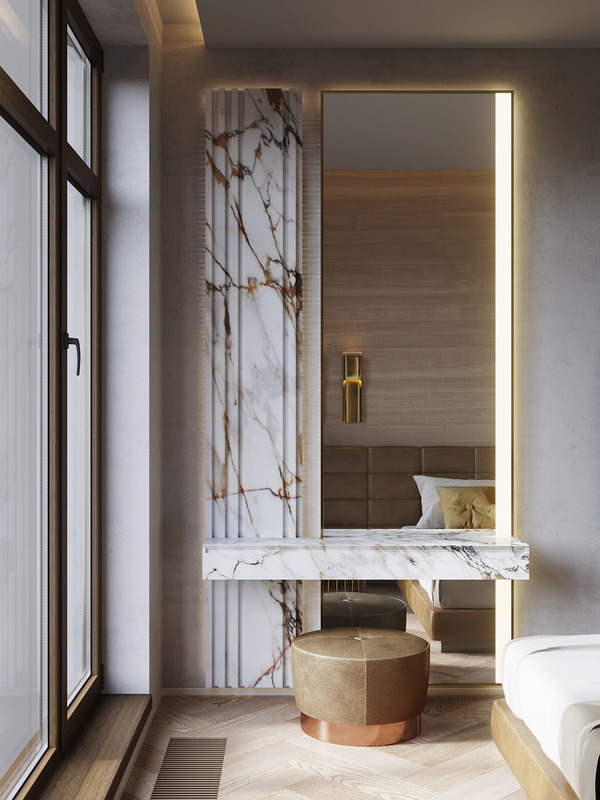 A marble dressing table appears to extrude from another wall panel. A tan leather and copper vanity stool picks out colours from the decorative feature. 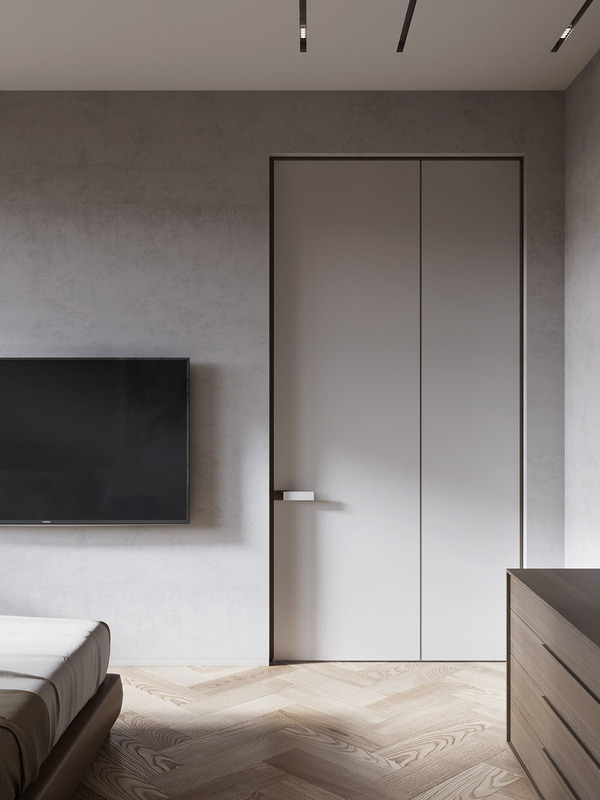 Herringbone wood flooring and a wood tone dresser complete the bedroom. 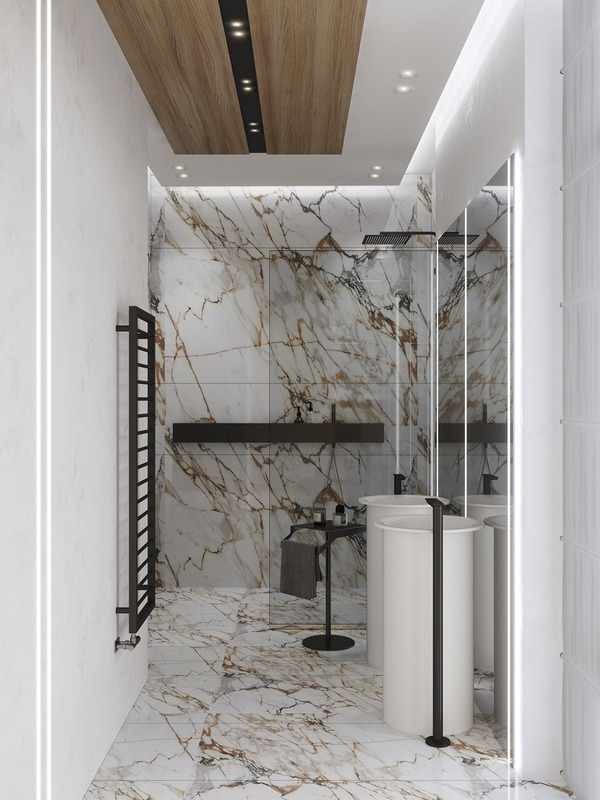 Heavily streaked marble appears like a work of art over the walls and floor of the bathroom. Its deeper colours are brought out by black bathroom fixtures and fittings. A black and white unique faucet and sink combo stands at each of the floor to ceiling bathroom mirrors. A bespoke wooden ceiling panel draws the eye up and over. 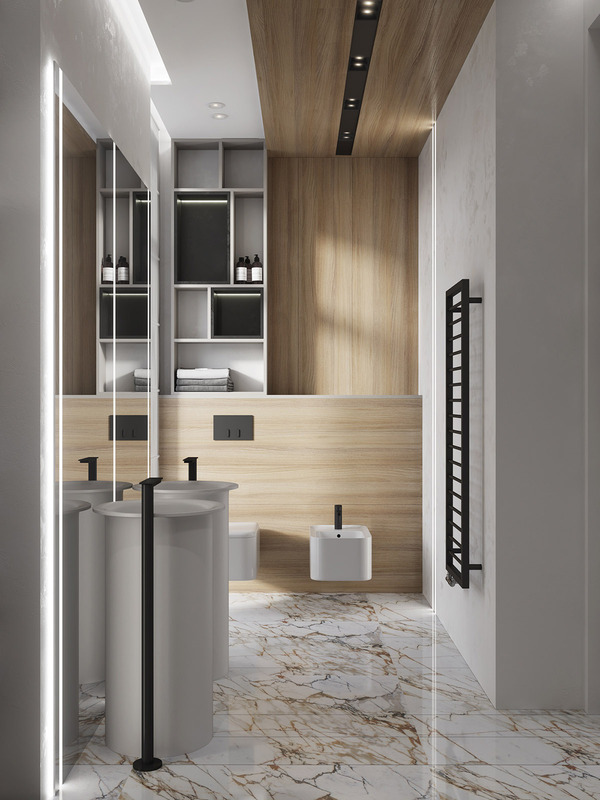 Soft LED lighting adds to the high-end look of the luxury bathroom scheme. 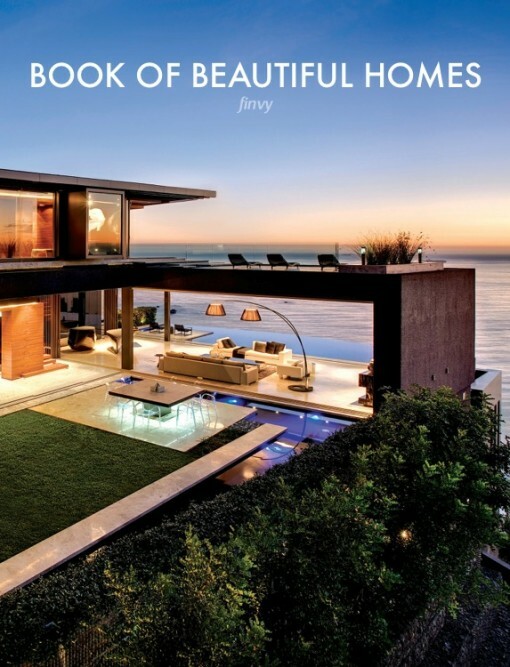 The mirror lights brightly gleam over the glossy marble floor. 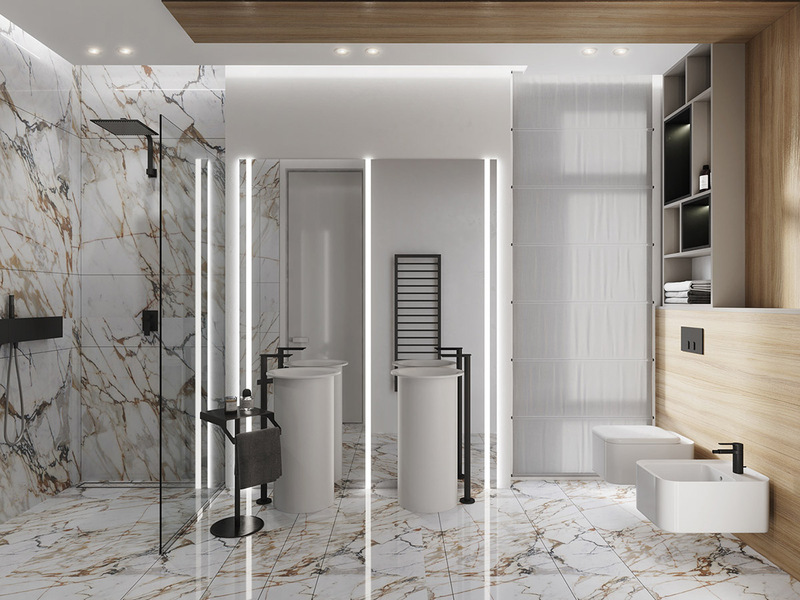 By the entry door, a storage console has lighting underneath and appears floating over marble tile. Wood slats flank either side of a hallway mirror, giving the tiny zone its own special identity.